Several events took place during that intervening period, the most important, which is also history, is the inauguration of the Investigative Judgment when “one like the Son of man came . . . to the Ancient of days” “and he came and took the book out of the right hand of him that sat upon the throne” at the end of the 2300 days (see Daniel 7:13; Revelation 5:7 and Daniel 8:14) October 22, 1844 some ten years after “the stars of heaven fell unto the earth” (Revelation 6:13). 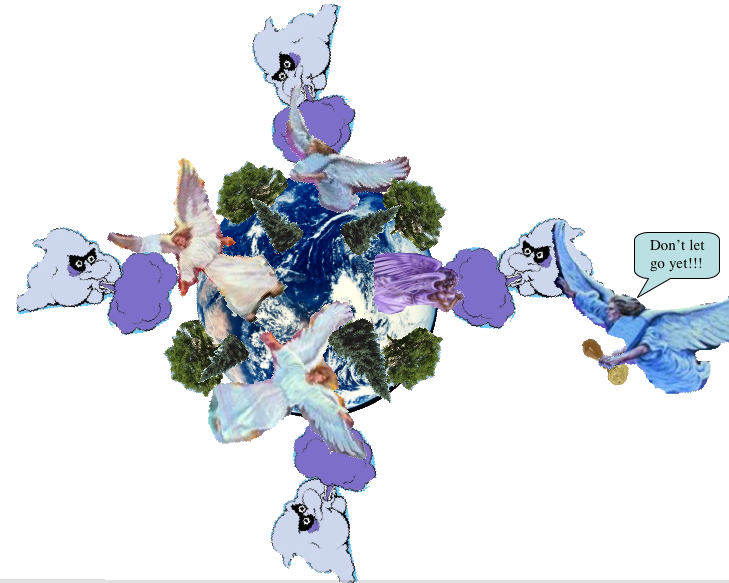 Verse 1: And after these things I saw four angels standing on the four corners of the earth, holding the four winds of the earth, that the wind should not blow on the earth, nor on the sea, nor on any tree. These “angels” are good angels because they are restraining the “four winds” representing, in general the global forces of evil, and specifically “the efforts of Satan to spread ruin and destruction everywhere.”  “John sees the elements of nature—earthquake, tempest, and political strife—represented as being held by four angels. These winds  are under control until God gives the word to let them go.”  The holding of the four winds, of course, is what is going on right now, even as we speak! Recall the violent “red” and “pale” horses, featured in the second and fourth seals of Revelation 6:4, 8 which match that description quite well. Astride them sits Satan, the enemy of all souls good or bad. But, there are other things preceding the second coming which the saints must be prepared for, namely the “time of trouble” inclusive of a destructive rampage likes of which will have never been seen “since there was a nation even to that same time” (Daniel 12:1) coupled with the 1335 “days” (Daniel 12:12)  that the saints must endure before the special resurrection. God, through John, tells us about them, not to frighten us, but because he loves us and wants us to know what to expect and be prepared to face them. 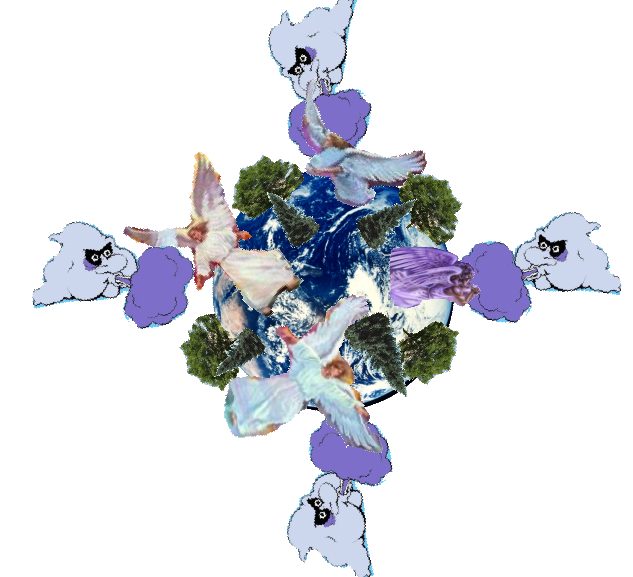 Therefore, Christ is this other “angel.” But, while he is depicted as a “Lamb” exercising His wrath in Revelation 6:16 after He came down from heaven to earth, here He is seen “ascending from the east” instead of coming down from the east at the time of His second coming. His cry “with a loud voice” is suggestive of the cry of “the third angel” who also says “with a loud voice, if any man worship the beast and his image, and receive his mark . . . the same shall drink of the wine of the wrath of God . . .” (Revelation 14:9-11). Therefore, this cry must refer to the “fifth seal” scenario of Revelation 6:9-11 and also the “tidings out the east and out of the north” that troubles “the vile person” who has “intelligence with them that forsake the holy covenant” after which “they shall place the abomination that maketh desolate” (Daniel 11:44, 21, 30, 31). Since there will be “no hope” after their release means that the “four winds” will “blow” unrestrained after the close of probation. Therefore, as long as the “four winds” are begin restrained or held back, probationary time will linger. Verse 3: Saying, Hurt not the earth, neither the sea, nor the trees, till we have sealed the servants of our God in their foreheads. 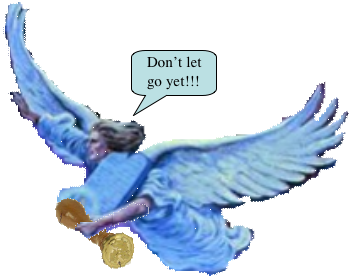 “When the four angels finally let go and cease holding in check the malicious designs of Satan and ‘the fierce winds of human passion, all the elements of strife will be let loose. The whole world will be involved in ruin more terrible than that which came upon Jerusalem of old.’”  The command “Hurt not” is expressive of divine reluctance to allow that which will hurl “the kings of the earth . . . the great men, and the rich men, and the chief captains, and the mighty men, and every bondman, and every free man” to their doom (Revelation 6:15). Therefore, all will be “sealed;” either with the “mark of the beast,” or God’s “seal.” His sealing does not in any way infringe on the power of choice. 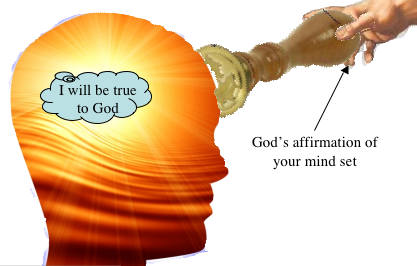 Rather God will stake His reputation on the firmness of your decision to be loyal to Him no matter what! Even Satan will marvel at God’s audacity. If any one of the sealed saints should waver, Satan would win the last battle in the final conflict! Verse 4: And I heard the number of them which were sealed: and there were sealed an hundred and forty and four thousand of all the tribes of the children of Israel. Note the first words of this verse: “I heard the number…” Then compare with the first words of verse 9: “After this I beheld…” Therefore, John did not see the group numbered as the 144,000, but he did see the great, unnumbered multitude. That suggests that the 144,000 are designated as a special group of people within the great multitude.. Therefore, it seems that the experience of both groups is essentially the same except that the 144,000, like “the people that do know their God shall be strong, and do exploits” (Dan.11:32), the great, unnumbered multitude. That concept coincides well with the idea that, in the final hours of earth’s history, 144,000 white horse people will “instruct” the “many” depicted here as the “great multitude” of black horse people. Note verse 14 where “these are they that come out of great tribulation indicating that both groups share the same tumultuous experience. That “time of crises,” as we learned in chapter 6, is delineated by the opening of “the fifth seal” in verses 9 to 11 which is the test that all must have before they are sealed. These 144,000 “servants” did not run and hide seeking their own safety, but understanding the meaning of this crisis, went forth to warn the world with the last message from God that will ever be given. Being aware of Revelation 20:4 where John “saw the souls of them that were beheaded for refusing to worship “the beast, neither his image” or to receive “his mark” would place them in great danger of a martyr’s grave, they cast all fear aside because their concern was for their fellow men rather than their own safety. They are unafraid of “the sword . . . flame. . . captivity” or “spoil” [as depicted in Daniel 11:33] that could come to them because of their courageous testimony. So, their will be far more than 144,000 who answered the call of the Holy Spirit to give this message because “the scenes of the betrayal, rejection, and crucifixions of Christ . . . will again be reenacted on an immense scale,” much more than 144,000. Therefore, all of them knew they were at risk of a martyr”s grave. Verses 5-8: Of the tribe of Juda were sealed twelve thousand. Of the tribe of Reuben were sealed twelve thousand. Of the tribe of Gad were sealed twelve thousand. Of the tribe of Aser were sealed twelve thousand. Of the tribe of Nepthalim were sealed twelve thousand. Of the tribe of Manasses were sealed twelve thousand. Of the tribe of Simeon were sealed twelve thousand. Of the tribe of Levi were sealed twelve thousand. Of the tribe of Issachar were sealed twelve thousand. Of the tribe of Zabulon were sealed twelve thousand. Of the tribe of Joseph were sealed twelve thousand. Of the tribe of Benjamin were sealed twelve thousand. Even though verse 4 stipulates these to be the names “of all the tribes of the children of Israel,” the names of two outstanding tribes are missing here and two are added to preserve the number. Going back to the book of Numbers, we find four leading tribes were listed under what Moses called “standards.” First, “on the east side” was “the standard of the camp of Judah.” Next “on the south side” was “the standard of the camp of Reuben.” Then, “on the west side” was “the standard of the camp of Ephraim.” Last, “the standard of the camp of Dan” was “on the north side” (see Numbers 2:3, 10, 18, 25). Note, only two leading tribes, Juda and Reuben, are listed with the 144,000 while Dan and Ephraim are missing. The Commentary suggests: “Perhaps Dan was excluded because of that tribe’s reputation for idolatry.” And, “To reckon Levi and yet retain the number 12 it was necessary to omit one of the tribes, namely Ephraim and Manasseh.”  So, from that standpoint, Ephraim was arbitrarily omitted and Manasses retained. I suggest another explanation. According to Jewish tradition, the emblem on the standard of the camp of Judah, was a lion; camp of Reuben by the face of a man; Ephraim by the face of an ox; and Dan by the face of an eagle  which coincides with the appearances of the “four beasts” of Revelation 4:7, all of whom invited John to “Come and see” the four horses of the apocalypse depicted in Revelation 6:1-8. 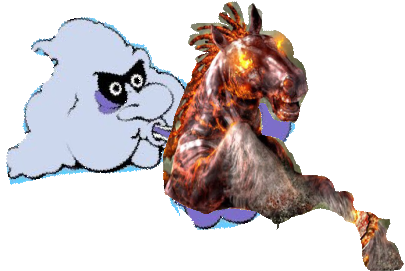 Interestingly, the “beast with the face of a calf” is associated with “Ephraim,” and the other “like a flying eagle,” is associated with “Dan.” Note that the “beast” who introduced the “horse that was red” is associated with Ephraim and the “beast” who introduced the “pale horse” is associated with Dan. As we just learned, the “red” and “pale” horses are controlled by Satan. The other two, introduced by the “beasts” with the faces of a “lion” and a “man” who introduced the “white” and “black” horses, are controlled by Christ and are associated with Juda and Reuben. Therefore, there is good reason to eliminate the two leading tribes of Ephraim and Dan. So, the symbol of the “palm tree” represents the character of the overcomer, who is victorious in spite of the adverse circumstances that surround him. It signifies victory in the lives of the people that the “cherubim” with “the face of a man” invites us to “come and see” and the “cherubim” with the face of a lion” invites us to “come and see” in Revelation 6:5 and 1. So, what happens after the saints are sealed? Obviously, the “earth, sea, and trees” will be “hurt.” But, wait, there is more before that happens! Note that John only “heard the number of them which were sealed . . . an hundred and forty and four thousand . . .” (verse 4) but, here, he “beheld” (or “saw”) this “great multitude which no man could number . . .” suggesting the 144,000 were in among the “great multitude” and they all looked alike! While we may personally favor one over the other, we should try to take all the facts into consideration before making up our minds. Since John only “heard” the number of the 144,000, and then “saw” the “great multitude,” it is difficult if not impossible to distinguish one group from the other. From that standpoint, view 1) seems to coincide well in that they are not at all different, because they appear identical with the 144,000 being symbolic of what is unnumbered. Mrs. White appears to support view 2) saying, in context with the postmillennial scenario of Revelation 21: “ those who honored the law of God when the Christian world declared it void, and the millions, of all ages, who were martyred for their faith. 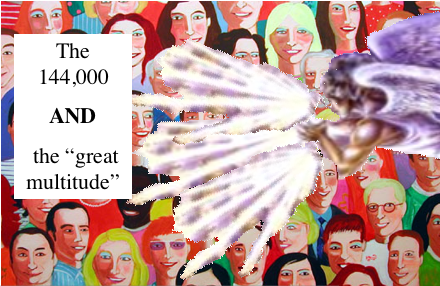 And beyond is the ‘great multitude which no man could number, of all nations and kindreds and people and tongues,’ ‘before the throne and before the Lamb, clothed with white robes, and palms in their hands . . ”  But, that statement depicts a post millennial scene, while this is clearly pre millennial. If, therefore, the 144,000 and the “great multitude” cannot be separated from each other, why is such importance attached to the numbered, 144,000, group of people that John could not identify visually? What does it mean “to stand with a wonderful truth right before the whole world . . .”? Obviously, to preach. What message would they “preach?” It would be the three angel’s messages of Revelation 14:6-9 that is depicted in the context of the “hundred forty and four thousand” who, among other things are called “the firstfruits unto God and to the Lamb” in Revelation 14:1,4. Verse 10: And cried with a loud voice, saying, Salvation to our God which sitteth upon the throne, and unto the Lamb. The cry “Salvation to our God which sitteth upon the throne” seems to be uttered at the same time others cry “to the mountains and rocks, Fall on us, and hide us from the face of him that sitteth on the throne, and from the wrath of the Lamb.” (Revelation 6:16). This cry of the great multitude is an echo of “the song of Moses” (Revelation 15:3) when “Israel saw that great work which the LORD did upon the Egyptians: and the people feared the LORD, and believed the LORD, and his servant Moses. Then sang Moses and the children of Israel this song unto the LORD, and spake, saying, I will sing unto the LORD, for he hath triumphed gloriously: the horse and his rider hath he thrown into the sea. The LORD is my strength and song, and he is become my salvation: he is my God, and I will prepare him an habitation; my father’s God, and I will exalt him. The LORD is a man of war: the LORD is his name. Pharaoh’s chariots and his host hath he cast into the sea: his chosen captains also are drowned in the Red sea” (Exodus 14:30 to 15:4). In context with that thought, God will have just rescued the “great multitude” from certain death at the hands of the wicked in the very last moment of earth’s history when “a universal decree will denounce these as deserving of death.”  Instead of the Egyptians, God’s people will behold “the kings of the earth, and the great men, and the rich men, and the chief captains, and the mighty men, and every bondman, and every free man, hid[e] themselves in the dens and in the rocks of the mountains” (Revelation 6:15) that the “great multitude” had just been hiding in! 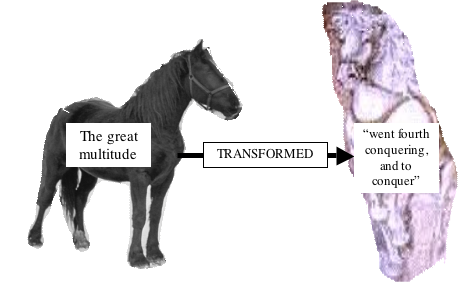 In the symbolism of the white and black horses of Revelation 6:2 and 5, we can assume the great multitude to be represented by the black horse, the great multutitude of the world who are doing the best they can in spite of their ignorance. They will have been transformed into the white horse who goes forth “conquering and to conquer” because they accepted the “loud cry” of the three angel’s messages first given by the 144,000, the final message of mercy to a lost world. Verses 11 & 12: And all the angels stood round about the throne, and about the elders and the four beasts, and fell before the throne on their faces, and worshipped God, Saying, Amen: Blessing, and glory, and wisdom, and thanksgiving, and honour, and power, and might, be unto our God for ever and ever. Amen. Note the similarity of this scene to Revelation 5:11 and 13 where John “beheld, and . . . heard the voice of many angels round abut the throne and the beasts and the elders . . . saying, Blessings, and honour, and glory, and power, be unto him that sitteth upon the throne, and unto the Lamb for ever and ever” just after the “Lamb . . . came and took the book out of the right hand of him that sat upon the throne” in verse 7. Since that “book” contained the “influence of every nation, tongue, and people from the beginning of earth’s history to its close,”  they were celebrating the commencement of the judgment (Oct.22, 1844 at the end of the 2300 days of Daniel 8:14) that could not have begun without the blood of the “Lamb as it had been slain” in verse 6 enabling Him “to open the seals thereof” (verse 9). Verse 13: And one of the elders answered, saying unto me, What are these which are arrayed in white robes? and whence came they? 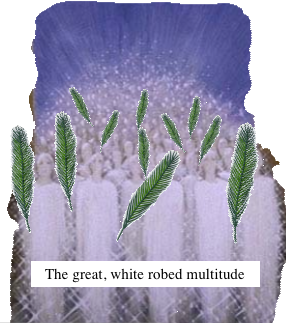 Although there is much debate over the answer to the first part of the question, it, at least, seems clear that the white robed people are identified in verse 9 as “a great multitude, which no man could number . . . clothed with white robes.” Recall also that this was the only group that John actually saw according to verse 9 in contrast to verse 4 that says he only “heard the number of” the 144,000. Verse 14: And I said unto him, Sir, thou knowest. And he said to me, These are they which came out of great tribulation, and have washed their robes, and made them white in the blood of the Lamb. Consequently, from the standpoint of the Spirit of Prophecy this “great tribulation” is the one “mentioned in Dan.12:1” which is not only future, but post probationary after “Michael” stands up. This “great tribulation” is what Daniel termed “a time of trouble, such as never was since there was a nation even to that same time:” (Daniel 12:1)  after “Michael [stood] up” meaning that it takes place during post probationary time. So, what do we learn from that? A “third” of the total world’s population would be more than two billion. That is a “great multitude,” but greatly in the minority compared to the other four billion! 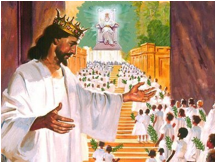 Verse 15: Therefore are they before the throne of God, and serve him day and night in his temple: and he that sitteth on the throne shall dwell among them. Therefore, the “great multitude” will exhibit Philadelphian characteristics even though the “great tribulation” will have had to take place during the final hours of the Laodicean period of church history. Verse 16: They shall hunger no more, neither thirst any more; neither shall the sun light on them, nor any heat. “They have seen the earth wasted with famine and pestilence, the sun having power to scorch men with great heat, and they themselves have endured suffering, hunger, and thirst. But ‘they shall hunger no more; neither thirst any more; neither shall the sun light on them, nor any heat;”  a characteristic of one of the plagues when “the fourth angel poured out his vial upon the sun; and power was given unto him to scorch men . . . with great heat” (Revelation 16:8, 9). Verse 17: For the Lamb which is in the midst of the throne shall feed them, and shall lead them unto living fountains of waters: and God shall wipe away all tears from their eyes. 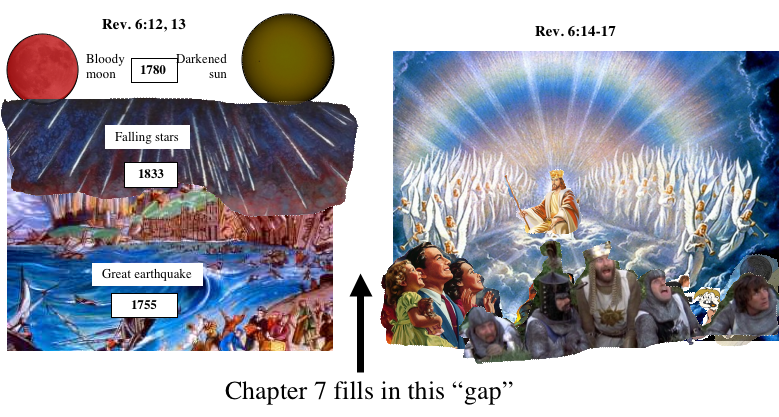 Keep in mind this is still sixth seal scenario which is designed to answer the question “who shall be able to stand?” in Revelation 6:17 even though this scene shows the saints in heaven sometime after the second coming. Therefore, this is a prospective look forward beyond the sixth seal to show the glorious reward that will accrue to the saints after all has been said and done. The next chapter begins with the opening of the “seventh seal” which depict many other things that will happen before the saints will actually find themselves being led “unto living fountains of waters” in heaven. Note, there are two occasions in the book of Revelation when “God shall wipe away all tears from [the] eyes” of the saved. The next occasion, in Revelation 21:3, will take place in the “new earth” after the “lake of fire” has purified the former earth. But, here, the “great multitude” has just come “out of [the] great tribulation” depicted in verse 14, which will transpire at least a “thousand years” before the “lake of fire.” At that time God will have snatched them from the jaws of certain death at the hands of “the kings, great men, rich men, chief captains and the mighty men” (Revelation 6:15) who were seeking to exterminate them. So, why would they be weeping? Certainly not because they had just been rescued, but because they loved their enemies and had longed for their salvation. The saints, even after examining the record of sinners for a “thousand years,” learning all the details of their sinful lives, will still feel the same way even after they were “cast into the lake of fire”! None of the saints will feel superior to the wicked nor exalt over them knowing, were it not for the sacrifice of the “Lamb” and His providences in their lives they too would suffer the same fate. Consequently, God will comfort them even though His action will be fully justified in their tearful eyes. Remember, this is “indefinite time.” It cannot be computed prospectively, only retrospectively sometime after the close of probation. Manuscript Releases, Vol.20, page 269 (italics supplied). Note the phrase “no hope” meaning that probation will be closed when the four winds are released. see Manuscript Releases Vol., 21 page 326 then research the context from pages 325 to 328. In Acts of the Apostles page 602, Ministry of Healing page 507, and Manuscript Releases Vol.21 page 326, she quotes Revelation 7:9, 10 followed by verses 14-17 with no reference to the 144,000. Therefore she is correct in all her quotes as far as I’m concerned. This is one of the most wonderfully encouraging prophecies in the book of Revelation! It has given me great hope for the future in spite of the dark clouds of trouble that is coming to the world. It is commonly held that the “great multitude” are the saved of all the ages. If that were true, they could not have “come out of the great tribulation” because the “first resurrection” occurs just before the second coming and after the tribulation. A good reference is found in 21MR 326 where Rev.7:9-17 is quoted in context with several other features of the future time of trouble, such a: “the temporal millennium they (the wicked) had been expecting, the “Sunday law,” Satan’s personation of lost loved ones, the beast and his image, etc. To me that is very convincing that the “great multitude” of Rev.7:9 go through the time of Jacob’s trouble, which is synonymous with the “great tribulation.” They go through it along with the 144,000. “As of May 31, 2009, the Earth’s population is estimated by the United States Census Bureau to be 6,792,467,727. . . .Since births outnumber deaths, the world’s population is expected to reach about 9 billion by the year 2040.” (http://en.wikipedia.org/wiki/World_population.) 6,792,467,727 divided by 3 = 2 billion, 226 million, 415 thousand, 591 persons. Add another billion if time lasts to 2040!